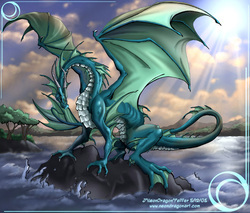 One of the more magical Clans, the Water Dragons adore the sea and waves. They posess the uncanny ability t desalinate water with a touch of their hand, making them useful companions for sea voyages.Water Dragons, anlong with the Light dragons, are the healers of the Clans, taking in mortals that are greviously wounded and healing them to the best of their ability. Sometimes, they disguise themselves as traveling healers, and heal anyone that needs their help during their travels.